Lay one half of a graham cracker flat-side up (this will be the bottom of the s’more). Top it with one half of a milk chocolate bar. Then top the chocolate with 2 roasted marshmallows. Next top with one half of a graham cracker flat-side down. 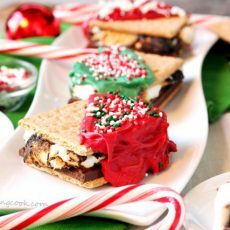 Gently push down the top graham cracker so that the roasted marshmallows cover the chocolate as much as possible. Repeat the process for the remaining graham crackers, chocolate bars and roasted marshmallows. Lay the s’mores on a parchment paper-lined (or wax paper) cookie sheet so there is an equal amount of space in between each s’more. Working with one color at a time, melt the candy melts based on the package instructions. Spoon the melted candy over half of a s’more (diagonally). Then quickly top it with candy sprinkles before the candy coating sets. Repeat the process with the remaining s’mores. Put the cookie sheet in the refrigerator and let chill for about 20 minutes or until the candy coating is set and can easily pull away from the parchment paper. Just before serving, very very slightly warm each s’more in the microwave just enough so that the candy coating is soft and starts to melt (try 6 seconds at a time; not more than approximately 12 seconds in total).